Compiling an account of all the plot twists of top seed Frances Tiafoe's 6-2, 6-4, 4-6, 4-6, 6-4 win over Stefan Kozlov in the final of the USTA Boys 18s National Championship is nearly as daunting as it must have been to participate in their memorable encounter Sunday at Kalamazoo College's Stowe Stadium. After his semifinal win Saturday over No. 2 seed Taylor Fritz, Kozlov had promised a war with Tiafoe, saying, "all the friendship goes away and it's just battling until you fall." Kozlov did fall, both literally, when cramps set in during the fourth set, and figuratively, when he could not hold on to his 3-1 lead in the final set and lost the match. But an enthusiastic crowd, most of whom stayed for the entire four hour and twenty-four minute match on a cool and overcast afternoon, did not consider either player a loser, giving both rousing ovations after the tense conclusion of the first five-set final in Kalamazoo since 1992. Tiafoe cruised through the first two sets in the same form that he had displayed all week, using his forehand to keep Kozlov on the defensive and his serve to bail him out of any tight spots. Up two sets and leading 4-2 in the third, a routine win, if any best-of-five match in the juniors can be considered routine, was a handful of points away. "I knew in the back of my head he was going to keep fighting, and he did," said Tiafoe, a 17-year-old from College Park, Maryland. "He set the tone when he got a couple of overheads back, and me not winning that point, he breaks me, and the next thing you know we're playing three hours later and I'm down a break in the fifth and about to lose my mind. Two sets to love, and I'm going to lose this match? Oh my god." Serving at 4-4 in the third, Kozlov saved two break points and was in no way discouraged. "Fight, fight, fight man, fight," he said to himself at deuce and when he took a 5-4 lead with a hold, added, "way to fight man, one more game." As good as his word, Kozlov broke Tiafoe at 30-40 after Tiafoe had saved two set points with aces, coming forward to put away a volley and secure the set. After a 10-minute break between the third and fourth sets, there were two routine holds to start the fourth. In the third game, Kozlov saved four break points for 2-1 but the first sign of his cramps appeared at the end of that game, and his left leg locked up in Tiafoe's service game. He received a medical timeout for treatment, which Tiafoe vehemently protested, but allowable under USTA rules. Kozlov had received treatment earlier for a knee problem, but his cramping was a separate condition. After treatment, Kozlov broke Tiafoe and managed to hold serve, with Tiafoe remarking that Kozlov was serving better while cramping than when he wasn't suffering. Tiafoe got the break back, going from 1-4 to 4-4, but again got down 0-40 serving at 4-5 in the fourth. He again saved two set points, but netted a forehand on the third, and the match was all even at two sets apiece. Tiafoe bounced his racquet and the ricocheted bounce came close to hitting a linesperson moving from her position, but there was no contact, so Tiafoe received only a point penalty for racquet abuse. The crowd, which had mostly supported Tiafoe up until that point, did not hold that display of temper against him, and after a medical time out for Tiafoe and a bathroom break for Kozlov, his second, Kozlov served to start the fifth set up 15-0. Since 1971, no player had ever forced a fifth set after losing the first two sets, so Kozlov was in uncharted waters. Saving two break points to take a 2-1 lead, Kozlov broke for a 3-1 lead with a great return. The lead didn't last long however, as he was broken in the next game on a double fault and Tiafoe held to make it 3-3. Tiafoe alternated brilliant shots with sloppy errors, but he showed few of the signs of physical fatigue that plagued Kozlov. Kozlov's cramps returned, and although he could still have changeover treatments (two more are allowed, after the first MTO), Kozlov was not able to receive assistance when he collapsed after double faulting at 15-all. Meanwhile, Tiafoe was jumping up and down in pogo stick fashion while Kozlov tried to collect himself. "That was sending him a message I was fine, which I wasn't," said Tiafoe. "On the way down, I felt a little something and thought wow, that could have been stupid. But I was trying to put pressure on, let him know that I'm staying here. It was better when he was trying though, because when he was limping around, I couldn't really play, I was missing a lot." Kozlov held when Tiafoe missed three makeable shots after getting the game to 15-30, and Tiafoe followed with a hold for 4-4. Kozlov had a game point serving at 4-all, but double faulted at 40-30. He earned another game point, but a Tiafoe forehand forced an error. At the second deuce, Tiafoe hit the shot of the match, a lethal running forehand pass that gave him a break point, and he converted it with a backhand putaway at the net. "I saw it open," Tiafoe said of that forehand. "At that point, you're so tired. Everyone anticipates the cross on the pass, but it's a shot you have to go for. If you miss it, so what, but you have to go for it. I pretty much hit it as hard as I could, with some spin though, and it dropped in. After that, I'm running on adrenaline, the crowd was going wild." But Kozlov continued to fight and with Tiafoe serving for the match a great forehand return winner at 30-all gave Kozlov a break point. Despite indifferent results at the net late in the match, Tiafoe didn't shy away from it, and saved the break point with an almost casual forehand drop shot winner. Kozlov's forehand caught the tape on the next point to give Tiafoe his first match point, which Kozlov saved in a crowd-pleasing point that was the last of many throughout the match. A double fault gave Kozlov a second break point, but Tiafoe saved that with a backhand putaway so violent that he eventually ended up in the crashing into the net. The chair was ready to call a touch, but the Darrell Davies, the referee, ruled the point was complete before Tiafoe made contact with the net. That decision earned Davies a high five from Tiafoe and a subsequent ace gave Tiafoe another match point. A big forehand gave Tiafoe his opportunity and he moved forward, with the tournament's last point a backhand volley winner. "I couldn't really make a first serve, I had no legs that last game," said Tiafoe. "After that ace on deuce point, I pretty much knew it was over. I was going to come to the net the very next point with some forehand and just get in." After coming all the way back, Kozlov was disappointed, but even with such a crushing final set, he told the crowd he was happy for Tiafoe, and within 20 minutes they were signing autographs and joking as if the final was a distant memory. "It felt good being in a fifth set," said Kozlov, a 17-year-old from Pembroke Pines, Florida. "As a kid growing up, you dream about being in a fifth set at a slam or at Kalamazoo. So it was a lot of fun, it gave me a lot of adrenaline as you saw. Up 3-1 in the third, but I was battling with my body the whole match, just trying to play another point. I was almost ready to stop." Kozlov said getting ahead of himself, as he has found himself doing in finals prior to this one, was not an issue today. "That split second, that one point, changes the whole match," Kozlov said of his loss of concentration in previous finals. "But today, I don't think that happened. I just think that it was just a battle, two competitors playing. Trust me, I would have been very, very happy if I had won that match. It took a long journey to get it back from two sets to love down to get it to a fifth. It felt weird when the match was even. When he went up two sets to love, it was like we both won a match, if we didn't play three out of five. He won the first two, I won the next two. So it was a lot of fun." 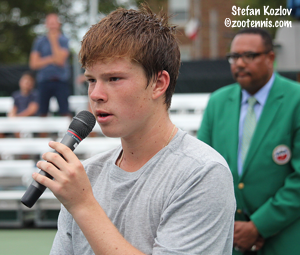 Tiafoe receives a main draw wild card to the US Open, with Kozlov receiving a qualifying wild card as the finalist. 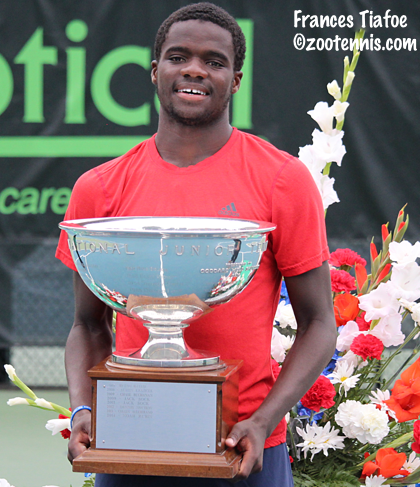 "I really just came here for that," said Tiafoe, who received a USTA wild card after not entering by the deadline. "I'm happy that I did it. I wasn't thinking this was going to be easy, in fact I knew it was going to be very tough, especially when I saw the draw. It's unbelievable that I finally got through and the US Open's definitely going to be great." Vesa Ponkka, the Director of Tennis at the Junior Tennis Champions Center in College Park, Maryland, where Tiafoe learned to play, believes the match was indicative of the bright future in store for American men's tennis. "This is my 25th year in Kalamazoo and it was worth waiting for, a match like that," Ponkka said. "It was so tough, not only physically, but mentally, and both guys handled it extremely well. It's so great for US tennis. I'm so impressed with this age group. Something good is going to happen, there's no question about it." In the 16s, No. 3 seed Patrick Kypson had said earlier in the week that the championship was in reach, and he collected it Sunday with a 6-3, 6-3 victory over No. 4 seed Alexandre Rotsaert. Kypson, who had an emergency appendectomy in June and was just getting back to competitive tennis last month after an infection kept him in a Miami hospital for 12 days, was pleased with his fast start in the championship match. "I was always on the offensive in the first set," said Kypson, who will be 16 in October. "I broke him at 3-2 and took that momentum and pretty much ran through the rest of the match, didn't really let him dictate. If you let him dictate, it's a lot harder, so I was happy with the way I played. That was the biggest thing. I won the first set. And I knew after I broke him in the first game of the second, all I had to do was hold serve and that'd be that match." On the rare occasion when Kypson got in trouble, his serve got him out of it. "I think that was a really big factor, when I needed it," said Kypson, who is from Greenville, North Carolina. "I got broken serving for it, but that was mostly nerves. My serve was really good today, I used it pretty effectively." Kypson had two match points with Rotsaert serving at 1-5 in the second set, but couldn't convert them, and Kypson failed to serve out the match at 5-2, making errors and double faulting in his worse game of the match. Even with defeat so close, Rotsaert never showed anything other than positive body language and still believed he could turn the match in his favor. "I try to stay positive," said Rotsaert, who also will be 16 in October. "I still thought I could. I thought I would raise my level when it mattered, but I wasn't able to do it." 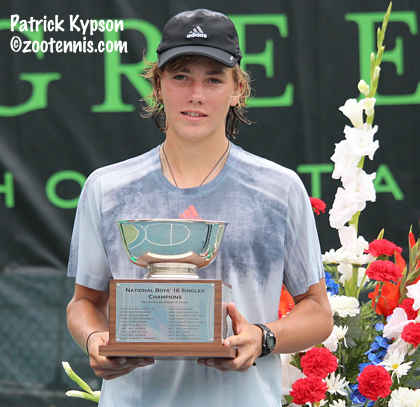 Kypson will play the ITF Grade 1 tournaments in Maryland and Canada later this month, then will make his US Open debut with the wild card he earned with the 16s title in Kalamazoo. Rotsaert, who was the 18s finalist at the Clay Courts last month, will also play in the two upcoming North American Grade 1s, and he said, "hopefully, somehow, the US Open." In the 18s feed-in final, Zeke Clark(16) took fifth place with a 7-6(10), 6-3 win over No. 9 seed Sam Riffice. Both Clark and Riffice lost in the second round of the main draw, so their trip to the tournament's final day was a long and arduous one. In the 16s feed-in final, unseeded Sean Hill defeated No. 7 seed Danny Thomas 6-3, 6-4 to take fifth place. Third place in the 16s went to JJ Wolf(1), who beat No. 8 seed Kyrylo Tsygura 6-2, 6-0. The Wes Richards Feed-In Sportsmanship award went to Riffice and the Bobby Kaplan 16s Sportsmanship award was given to Wolf. Complete results can be found at ustaboys.com. Jonathan Kelley has more coverage of this year's tournament at his blog, On The Rise. At the girls 18s USTA Nationals in San Diego, No. 3 seed Sonya Kenin earned a US Open main draw wild card with a 6-2, 5-7, 7-5 win over top seed Tornado Alicia Black, who was also the runner-up last year. I will have more on the other National championships and the World Junior Tennis finals on Monday. Could anyone give more information on why the referee would be making a ruling on the court, on a question of fact? Seems to undermine the chair official. Referee's generally only come to court and rule on a question of law/rule, FAC specifically says a referee can not rule on a question of fact (out call, touches, lets, etc..). So can not figure out why a referee would make that decision unless the chair specifically asked, which again makes me scratch my head and ask "why". The chair official controls the court.